About « Something Fancy Inc.
We are a small doll mold company located in Old Hickory, Tennessee, just outside of Nashville. 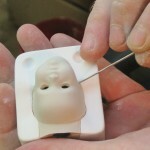 Something Fancy prides itself in being a company that specializes in the production of molds for rare and unusual dolls. We also have a line of fashion ladies, some originals and a variety of other molds. Something Fancy Molds includes: Something Fancy Antiques, Something Fancy Original Designs, Cachet’ Dolls, Duncan Molds and Vista Molds. We take an enormous pride in creating our dolls and molds, and hope that you’ll find something in our catalog that you like. We also can create custom orders; call or email and let us know what you want. We look forward to doing business with you. The mold company is owned and operated by Carl Armstrong and Margaret Cooke who are constantly searching to increase their antique collection and improve their knowledge of antiques.Carl Armstrong, also known as Fancy has been in the doll business since childhood. He has won numerous awards and is widely known for his painting of antiques and the production of fashion dolls.Margaret Jane Cooke has a background in art and early childhood education. Her main interest lies in sculpting and the use of color. She is also referred to as Hammer 015. Carl and Margaret work together in locating and reproducing unusual and desirable antique dolls and doll related products for mold production and sale. Our emphasis is on mignonettes and the older fashion types. We strive for quality and authenticity in our mold production. We are always on the lookout for interesting dolls and doll related products that will enhance our wide range of mold production and allow our customers to enrich their doll related endeavors.